I blame Hee Haw! All that singing and dancing to “keep my spirits up” has taken its toll. He has been limping around for the past two weeks, and while I have been accusing him of “sympathy pain” the x-rays confirmed an actual broken bone in his foot. He has no idea what happened. The doctor said since there was no defining event, it must have started as a hairline fracture. It is in the “Jones Zone” which makes it a little more interesting. 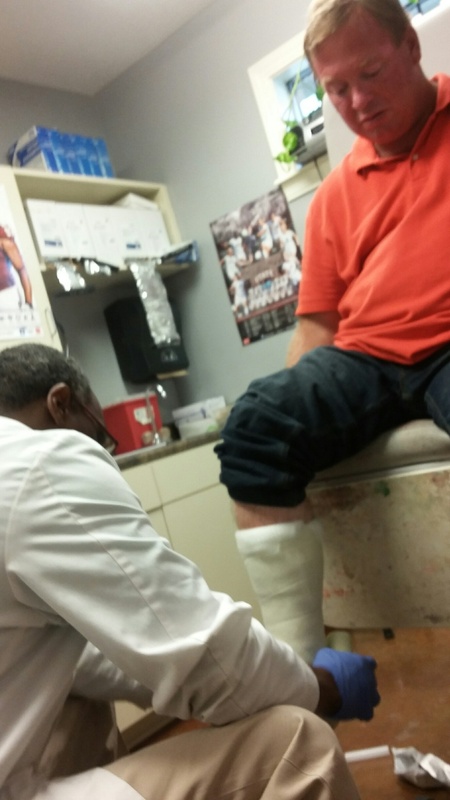 If he can not put any pressure on it and let it heal for three weeks in a cast and three weeks in a boot, he might be able to avoid surgery. We are SO glad we caught the problem in time to possibly avoid surgery! We will see what happens, but Pepper will NOT be dancing for a while. I think it would take laryngitis to squelch the singing, though!!!! I wish it was Dorothy! He is getting a little wild with all this “being indoors,” “propping a foot up” business!